Offering in-depth tribal caselaw analysis, Environmental Law in Indian Country focuses on the environmental work of the 562 Indian tribes that play an important role in the environmental arena. This publication covers the National Environmental Policy Act (NEPA), the Endangered Species Act, and the Wilderness Act. 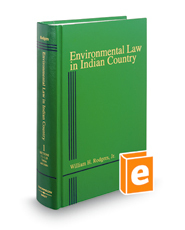 It uses primarily Indian and tribal cases (162 case studies total) to illustrate the finer points of NEPA doctrine as it exists in the broader field of Indian law. Convenient Tables of Cases and Laws and Rules help facilitate quick and easy research.